This page, a work-in-progress, will feature entries about key staff and Board of Management members from over the years. We’ll soon be adding entries to Team about key RealTime staff. 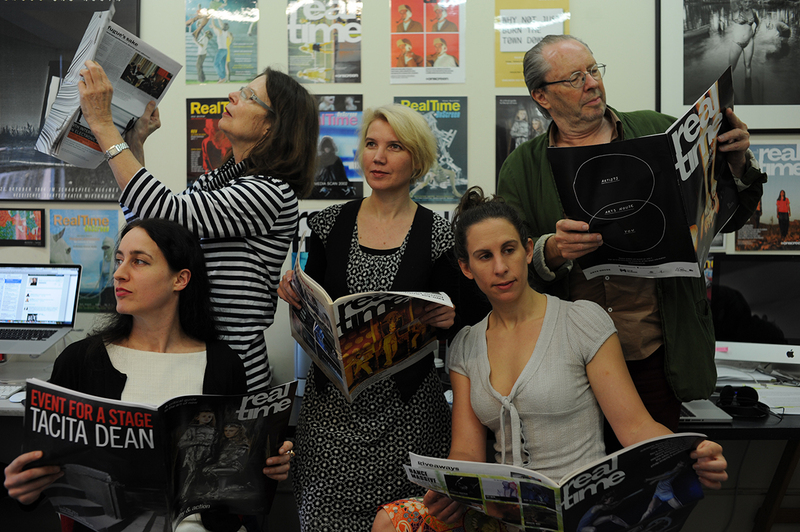 The RealTime team in 2014: Managing Editors Virginia Baxter and Keith Gallasch in 2014 with Associate Editor and Online Producer Gail Priest, Sales Manager Katerina Sakkas and Administrative Assistant Felicity Clark photographed by the doyen of performance photographers in Sydney, Heidrun Lohr. Virginia Baxter & Keith Gallasch. 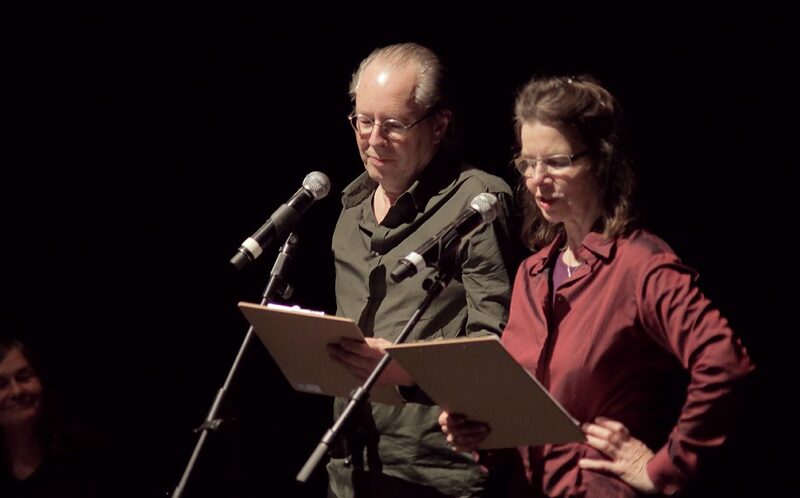 Theatre and contemporary performance practitioners, Virginia and Keith founded RealTime in 1994 as Managing Editors, editing, writing, running the business, producing specialist publications and conducting review writing workshops here and overseas. This is a biographical sketch which we’ll flesh out once we’ve had time to sit back and reflect on our 25-year RealTime adventure. We are Directors on the Board of Management of Open City Inc and Managing Editors of RealTime. Open City Inc was founded by us on the principle of openness: free access, collaboration, critical responsiveness, both as a performance company, 1987-1996, and as the publisher of RealTime, 1994-present, other publications and books, in forums and writers’ workshops. Prior to forming Open City, we had been members in the 1970s of Troupe, the first independent Adelaide theatre company committed to nurturing Australian playwriting. Keith acted, directed and wrote for Troupe and subsequently wrote for youth theatre companies in the early 80s and Legs on the Wall in the late 80s. He was a member of the Literature Board of the Australia Council, 1983-5. In the 1990s and early 2000s Keith was dramaturg for four productions by Griffin Theatre Company (including for two AWGIE-winning scripts) and one for Vitalstatistix. In the early 80s in Adelaide, after acting with Troupe, Virginia wrote and performed two solo works, Just Walk and What Time Is This House? She was the Chair (1992-99) of Playworks, the National Women Writers’ Workshop and edited the collected papers and performance texts of Playworks’ 10th anniversary event in 1995 as Telling Time (Playworks, 1997; revised 1999). She has worked as a dramaturg on performance and dance projects and was co-curator of the 2002 Antistatic contemporary dance event at Performance Space. For 22 years, we have written, commissioned, managed RealTime’s production, finances, distribution and sales, and conducted workshops here and overseas while maintaining the collaborative and responsive vision that is our own. In this we have been supported by committed and creative staff who are also writers. Drawing on RealTime’s archive and the extensive knowledge of its editors, the Australia Council for the Arts commissioned the highly respected and internationally distributed In Repertoire series (1999-2004) which we edited, promoting tourable Australian contemporary performance, music theatre, dance [two editions], Indigenous arts, new media art and theatre for young people. For the Department of Foreign Affairs and the Australian Film Commission (AFC) Keith and Virginia edited and produced Explorations: Films Indigènes d’Australie (2002), a catalogue accompanying a set of films gifted to the French Government in celebration of the voyage of Nicolas Baudin to Australia. For the AFC’s Indigenous Film Unit, RealTime edited and produced Dreaming in Motion, A Celebration of Australian Indigenous Filmmaking (AFC-RealTime, 2007), the first account of a generation of now acclaimed filmmakers. In 2014, RealTime and Adelaide’s Wakefield Press co-published Bodies of Thought: 12 Australian Choreographers, edited by Dr Erin Brannigan, UNSW, a long-term RealTime contributor, and Virginia; the project was managed by Keith. This collection of essays and interviews focused on a generation of independent choreographers who emerged in the 1990s and came into prominence in the 2000s. The book is one of the very few substantial volumes on Australian dance. We are currently working with co-editor SJ Norman (a leading Indigenous interdisciplinary artist) on a book about innovative Aboriginal art across the last two decades.